And here's my Happy Holidays card. I've been wanting to make one of these wreaths since I first saw it when I started blogging three years ago! This card is 5x7. I embossed the red paper with a Darice brick patterned folder. The window is cut from the Cricut Creative Cards cart. I cut a wreath from the Jolly Holidays cart and just covered it in branches using the Martha Stewart branch punch in 2 green cardstocks. The label frame is a Spellbinders die, and the sentiment is a wooden stamp. I love that the wreath looks so real! Tied a double bow with the plaid ribbon, and added some gems. Since this is the last challenge at Die Cuttin' Divas for this year, you'll have 2 weeks to link up your holiday project. 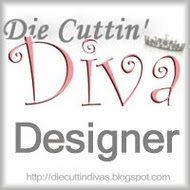 Please be sure to use a die cut and link your post back to the Die Cuttin' Divas blog. The challenges will resume on January 7, 2014! What a fabulous card! I love the embossing and the pretty wreath! Have a great day. This is gorgeous Pat!!! I just LOVE that wreath!! Awesome job! Wishing you and your family a very Merry Christmas! Beautiful! Love the little gems you added to the wreath. Hi Pat! So great to cross paths with you again :) This card is AWESOME!!! I love the brick wall and the wreath made of punches. I love this card - thanks for playing along with us at Exploring Cricut! I love this card-the wreath is GORGEOUS, the brick embossing great, the window fantastic! Thanks for joining us at Exploring Cricut! Beautiful!!!! Thanks for sharing with us this week at Exploring Cricut. Stunning card. Love how the wreath is on its window ready to go.. Your Christmas card is just beautiful! The wreath is gorgeous and I have wanted to make one for some time to:) I love the fun little gems you added to! Anyone would love to receive this! WOW! what a beautiful card Pat, I absolutely love it!! I also wanted to stop by and wish you a Merry Christmas just in case I don't make it to your blog before then:) Happy Holidays!! WOW!! This is just So BEAUTIFUL! Would love if you joined us at cut it up challenge!!! All of the elements of this card work perfectly together....I love it!! Thanks so much for sharing this week at HIMCR. We hope to see you back very soon! What an adorable wreath, I really love the little gems you added. Such a great little detail. Thank you for joining us at Exploring Cricut. That wreath is so pretty. So lush and full.